“I’ll tell you the same thing I tell people about the Zodiac case: if you knew more about it, you’d have a different opinion. Trust me.”Raymond Grant, author of The Zodiac Murders– Solved! In his book, The Zodiac Murders Solved, Raymond Grant presents his solution to the Zodiac mystery. According to Grant, the first editions of his book were self-published and released in November 1990. The book has undergone various revisions over the last two decades, with the author now presenting his theory and solutions on a website titled, thezodiacmurderssolved.com. Most observers will immediately note that the author’s theories and claims are convoluted, ridiculous, and border-line delusional. For most amateur sleuths, the belief that one has solved the Zodiac case is the intellectual equivalent of a disease, an affliction which infests the mind and renders it incapable of recognizing or utilizing logic, common sense, or facts. As one who has followed this case for decades, I have witnessed many men overcome by this disease, and Ray Grant is simply one of its many victims. Grant has adopted many of Penn’s pet theories, as well as his dubious methods. Over the years, I spent a lot of time researching Penn’s claims that O’Hare was the Zodiac– I learned that this theory had no merit and was not supported by any credible evidence. Gareth Penn claimed that Michael O’Hare worked on the condominium project depicted on the postcard apparently sent by the Zodiac on March 22, 1971. 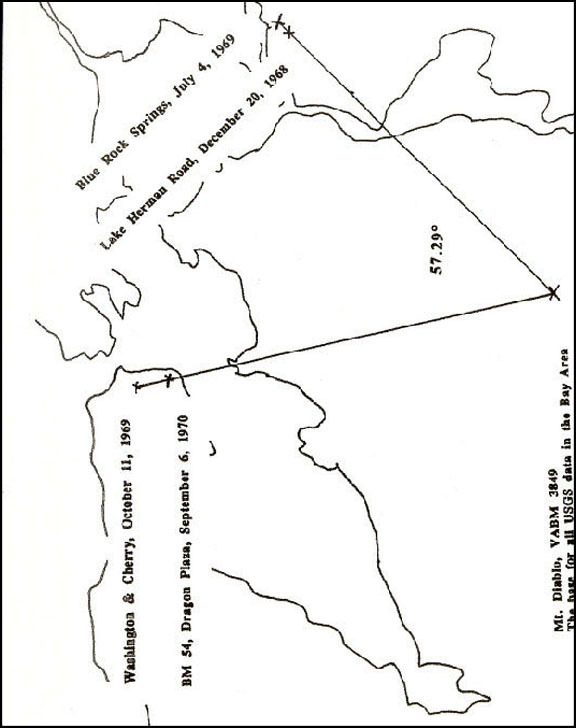 However, when I contacted the South Tahoe Regional Planning Agency for more information, I learned that O’Hare was not connected to the project in the records kept in their files. Further, O’Hare himself denied any involvement in this project, and Penn has never presented any credible evidence to prove this alleged connection (his claims about his private detective, etc., do not constitute such evidence). Penn also claimed that he was told by Chronicle reporter Paul Avery that the Zodiac had used a .38 caliber weapon to kill cabdriver Paul Stine. Penn had created elaborate theories about the significance of the number 38 and this factoid fit his theory. Paul Stine was killed by a 9mm handgun. Penn claimed that the so-called “Confession” letter, sent to the Riverside Press Enterprise newspaper in 1966, consisted of 1,623 characters– the significance being that this number represented O’Hare’s identity. Anyone who actually takes the time to count the characters in the Confession will note that Penn was wrong. These and other instances in which Penn’s facts proved less-than-true led me to conclude that he did not conduct any legitimate research as he developed his theories and accused O’Hare. 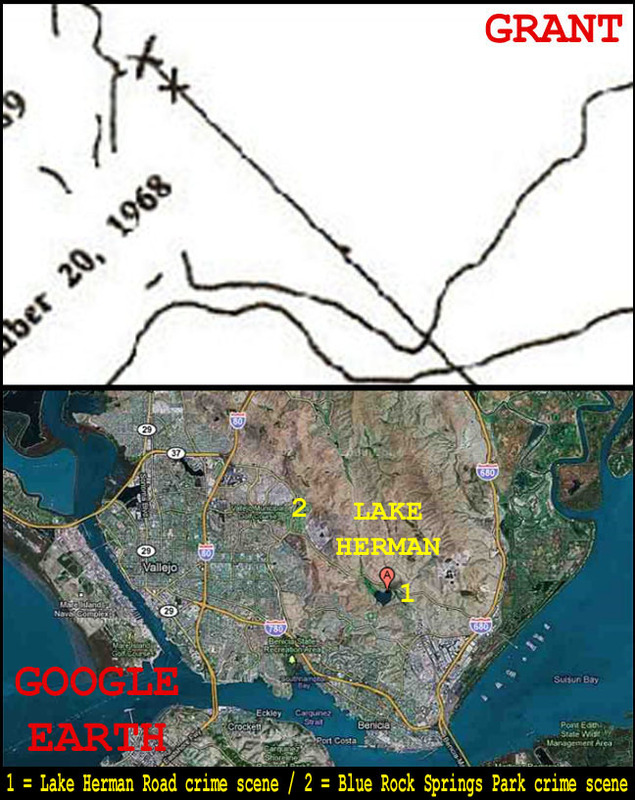 The greatest example of Penn’s inability to verify his own presentations and research comes in the form of what is perhaps his most enduring claim– the theory that the Zodiac created a giant radian angle with the geographic locations of his crimes scenes. In Penn’s theory, the Zodiac’s radian was a form of art, a geometric creation designed as part of an elaborate plan. According to Penn’s writings, and his book TIMES 17, the Zodiac’s radian was formed by Mt. Diablo, and two crime scenes– Blue Rock Springs Park in Vallejo and the intersection of Washington and Cherry Streets in San Francisco. Penn’s radian discovery earned him media attention in the early 1980s and served as the foundation for his book. The theory took on a life of its own, endorsed by many individuals (including myself) and “the Zodiac’s radian” became a permanent fixture in the pages of Zodiac history. Yet, Penn’s entire theory was wrong, and the fact that he did not know as much served as further proof that he had done little to check his own work before using his findings to accuse a man of murder. Ray Grant is following in Penn’s footsteps and repeating the same mistakes. On his site, Grant repeats Penn’s radian theory, apparently unaware that the theory has already been debunked and that this information is readily available on the Internet, including this site– which Grant mentions in his book. 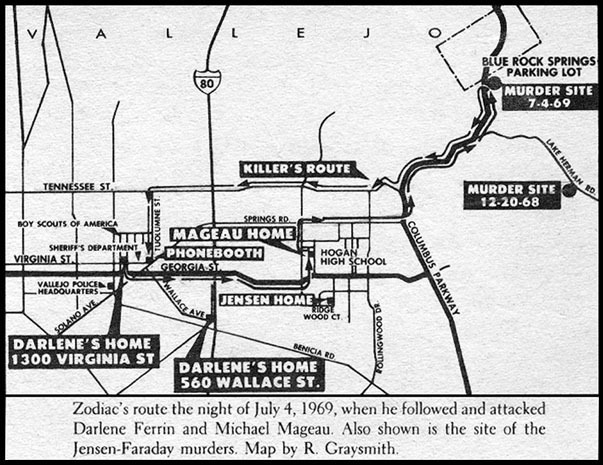 According to Grant, the Zodiac’s radian is “the starting point for the cryptographic speculation about the case… Frankly, I don’t see any alternative to the obvious implication: The Zodiac committed those murders to create that angle on the map.” On his website, Grant presents his own illustration of the radian theory. Like Penn, Grant never bothered to check his own placements of the crime scenes. 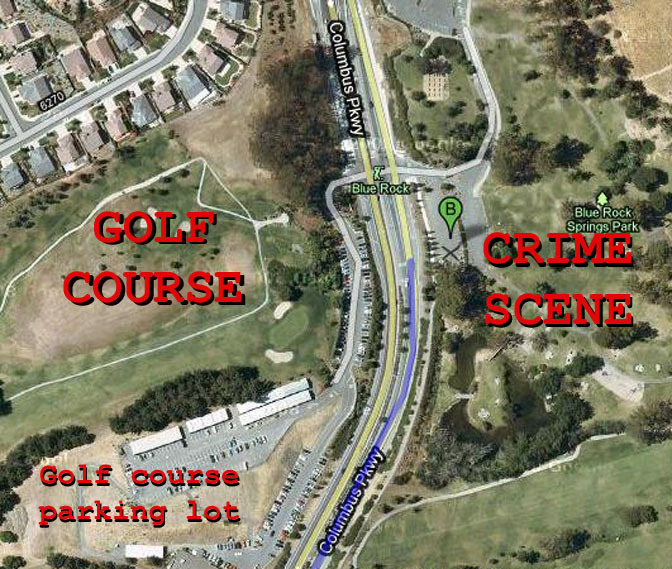 Grant’s placements of the Blue Rock Springs Park and Lake Herman Road crime scenes are completely inaccurate. Grant places these scenes far west of the correct locations. Grant simply reproduces the same mistakes from Penn’s book, as seen in the illustration below from TIMES 17. The aerial photograph below shows the actual crime scenes; these locations form an angle approximating 60 degrees or more. When compared to Penn’s radian illustration and Grant’s, this photograph clearly demonstrates that both men not only made the same mistake, for decades, but never even noticed. Such errors raise serious doubts about their research, conclusions, and claims. Grant claims that the Zodiac crimes were what he calls “The Zodiac Project,” and that the crimes were not the work of one man, but a collaborative effort by several people, including Michael O’Hare, Gareth Penn, O’Hare’s mother Berta Margoulies, and Penn’s father, Hugh Penn. Nowhere in Grant’s entire presentation does he provide any evidence to substantiate this claim or support his theory; he also fails to explain how these individuals knew each other or why they launched this murderous project in the first place. Grant simply decides that Berta Margoulies came up with this ridiculous plan and then runs with his silly theory. Grant claims that his theory is sound, despite the fact that he failed to provide anything remotely coherent. One element of Grant’s theory comes straight from Penn’s own take on the case– the notion that the watch found near the body of murder victim Cheri Jo Bates in Riverside was stopped at 12:22. While the now-infamous photograph of the watch (taken in police custody) actually depicts the watch time as 12:24, another photograph of the watch, taken at the crime scene, shows the time to be approximately 9:07– meaning, the watch never stopped running. Grant’s questions may seem logical, yet common sense once again offers a far more likely explanation. Police photographed the watch as evidence, and, in order to do so, they wanted the best picture as possible, for several reasons. 1) They needed a clear and complete shot of the entire watch, laid out for the camera– something they could not do until they removed the watch from the crime scene. 2) They photographed the watch, in clear light, under controlled conditions, in the hope that someone might be able to identify the watch at a later date. Yet, Grant needs this watch and the time for his theories. Like most theorists confronted with facts which contradict a favored theory, Grant invented his own explanation for this seeming discrepancy. Grant claims that Riverside authorities “made a second photo, posed at the crime scene or at some similar area, this time with a leaf for a prop, and set the watch to a more logical time for the photo—a few minutes after nine a. m.. This way, if the killer saw a photo of the watch, he’d assume it was still running when the police found it.” Read more about Grant’s theories regarding the watch found at the Riverside crime scene. Police could simply have chosen not to release any photographs of the watch at all, and therefore avoid this problem. The notion that they would fake crime scene photographs and more is exactly the kind of nonsense that a theorist would invent in order to avoid admitting that their theories are wrong. 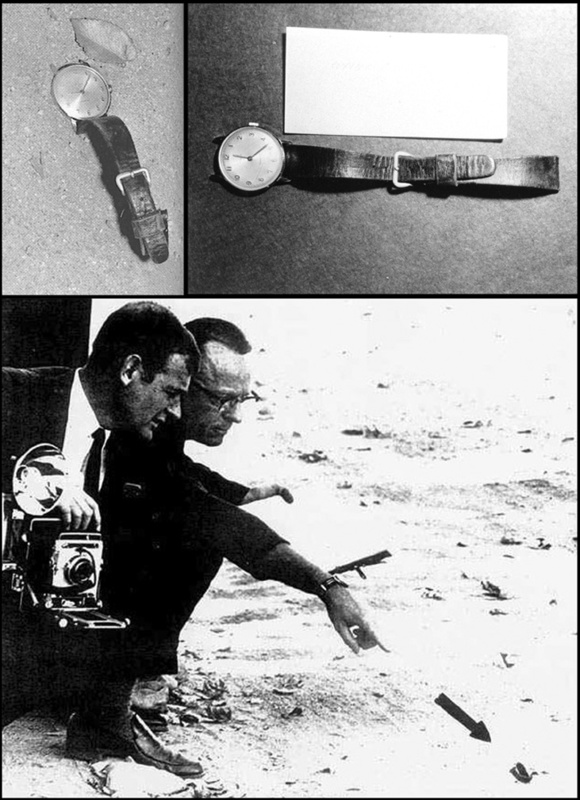 The watch never stopped, no one in law enforcement ever claimed it had, and the most obvious explanation is that the photograph of the watch on the ground, with investigators pointing at the time piece, is not sufficiently clear or detailed to accurately determine the position of the watch, and what appears to be a “coiled” watch band may actually be an optical illusion created by the broken half of the band, which is still connected to the other portion of the band on the other side of the watch. Grant wants us all to believe his theory because he needs the watch to be stopped at 12:22. Those who utilize common sense will be forced to conclude that other explanations are far more logical and in keeping with known facts. Grant wants us to believe that police staged and faked evidence, for no other reason than their fears that the killer might know that they knew what time the crime had occurred. Since the person who killed Bates knew exactly when he killed her and since police had no way of accurately determining the exact time of death, this entire theory is just insane. The horrible scream heard around 10:30pm was reported in an article which appeared in The Riverside Press-Enterprise Monday afternoon edition. Police must have known about the scream almost from the beginning in order for the Press-Enterprise to include this detail in their afternoon edition. Grant wants us to suspend our common sense, and to abandon logic and the facts, in favor of his explanation. I think most people are too smart to accommodate him. The official documents do not state that the watch had stopped, at any time. In fact, the official documents studiously omit this claim, stating only that the watch band was broken. If, in fact, the watch had been stopped at 12:22, this would either indicate the time of the attack or the killer’s effort to establish a false time of death in order to create an alibi for himself. In either scenario, investigators would view this information as important and include this fact in their reports. Grant seems to believe that the broken watch band is evidence that the watch itself was damaged or broken, however, as most people who wear watches can attest, it is not at all uncommon for the band to break while the watch itself remains intact. Ray Grant claims that the Zodiac was trying to relate biographical information by using the number 17. Grant repeats a false claim first introduced by Gareth Penn– that victims Bryan Hartnell and Cecelia Shepard were stabbed a total of seventeen times. Hartnell himself stated that he was stabbed six times. Therefore, the entire theory about the number of stab wounds is pure garbage. Throughout his book, Grant proves that he has relied on Penn’s incorrect and poorly researched accounting of the facts in this case. Grant believes that the number 180, or 180 degrees, somehow revealed the Zodiac’s identity. Grant wrote: This is why the Zodiac reviews The Exorcist in the first place. The girl in the film, played by Linda Blair, has two interesting powers. She can project vomit through the air (which might come in handy), and she can rotate her head 180.” Grant apparently did not watch the film, or he would know that Linda Blair’s head actually rotates 360 degrees. If her head rotated only 180 degrees, her head would have been backwards during the rest of the film. The fact that Grant even included that paragraph in his book serves as a strong indication that Grant is incapable of recognizing that his work is utterly laughable. The author’s style is also incredibly amateurish, using exclamation points and raving about his own work, writing, “Isn’t this fun!” as he explains his convoluted version of the story. The fact that Grant has been writing this book for two decades and still offers this kind of material is mind boggling. Throughout the history of the Zodiac case there has only been one instance in which someone claimed to have solved a Zodiac code and that solution was not only deemed correct by code experts but also accepted as valid by law enforcement– the work of Donald and Bettye Harden in August 1969. 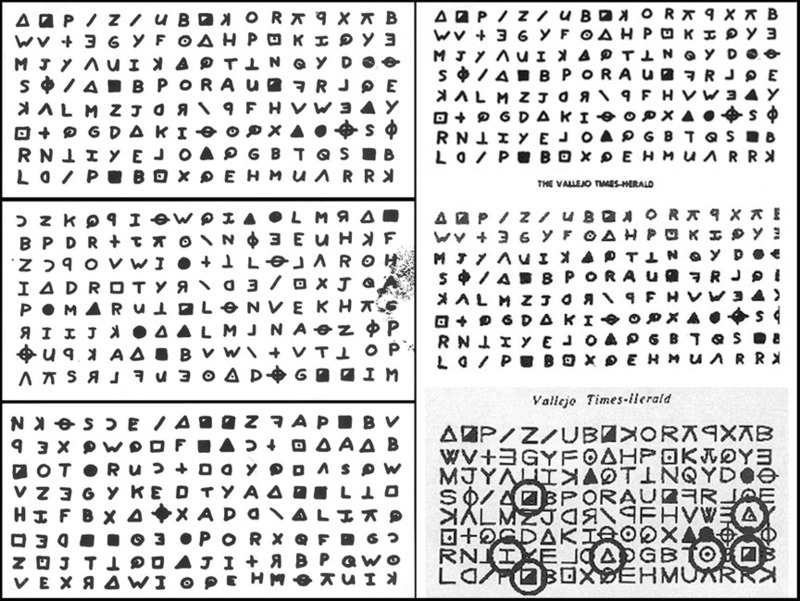 Their solution to the Zodiac’s code was not only accepted but also made sense and could be easily confirmed using their own worksheets and code key. Every other proposed solution has been so convoluted and forced that even amateurs can immediately recognize them as false. To date, no one has presented a plausible solution to any of the remaining unsolved Zodiac codes. Grant is not content to claim that the Riverside Police Department alone tampered with evidence. He also theorizes that authorities altered the Zodiac’s first coded message prior to its publication in the newspaper. This claim has no basis in fact and is refuted by photographs of the Zodiac’s actual handwritten codes. As these illustrations clearly demonstrate, the codes have not been altered by anyone– except Gareth Penn. While Grant may choose to view this as proof of Penn’s guilt, those who have followed his career and are familiar with his work will note this as just another instance in which Penn never bothered to check his facts– just like Grant. 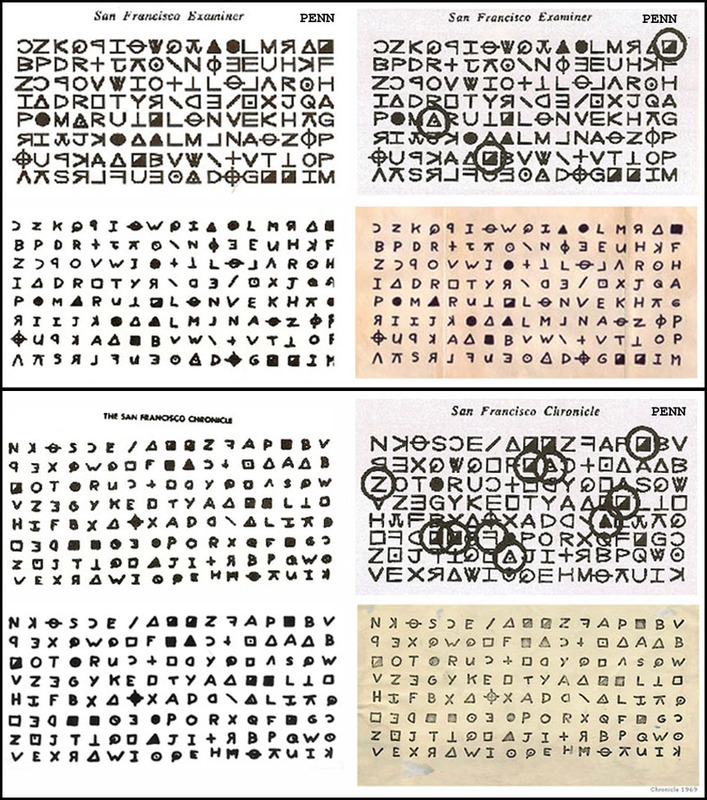 Grant’s entire claim of altered Zodiac letters is pure nonsense, and reminiscent of the recent claims by Dennis Kaufman that Robert Graysmith and others altered the writing in the Zodiac letters in order to prevent any expert from matching that writing to that of Kaufman’s suspect, his deceased step-father Jack Tarrance. Police conspiracies and official cover-ups are the bread and butter of the crackpots who have been dismissed by authorities. * Steve Hodel claims that a massive law enforcement conspiracy left his father free to commit the Zodiac murders and other crimes (and perhaps even the kidnaping of the Lindbergh baby). * Howard Davis claims that members of the LA DA’s office, the CA Attorney General, a judge, and countless others conspired to conceal the fact that the notorious Manson family was responsible for the Zodiac murders. * Lyndon Lafferty claims that a judge and others intervened to prevent the arrest of his suspect, William Joseph Grant. * Penn himself claims that authorities refused to intervene and arrest O’Hare because of their belief that the Zodiac couldn’t be someone like O’Hare, despite the fact that police have consistently entertained virtually every theory regarding the Zodiac’s identity, including the ridiculous claims of Deborah Perez and so many others. * Sandy Betts told her wild tales to many investigators over the years and no one believed that she was a credible person. According to one official report, Betts was told that her stories had no merit and she responded by claiming that there was a conspiracy between the California Department of Justice and the Zodiac suspects. Ray Grant has simply joined a long list of crackpots making similar claims, and the evidence he presents to convince the world that he has solved the Zodiac case has been just as questionable as the efforts by his original inspiration, Gareth Penn. Grant adopts one of the more disturbing aspects of Penn’s approach– the claim that he doesn’t need to provide any real evidence because his own solutions to the Zodiac codes are so irrefutable as to negate the need for real evidence. This position allows Grant to avoid any and all accountability for his claims, giving him a ready-made excuse to ignore his critics by claiming that we’re all just too stupid to understand his brilliance. 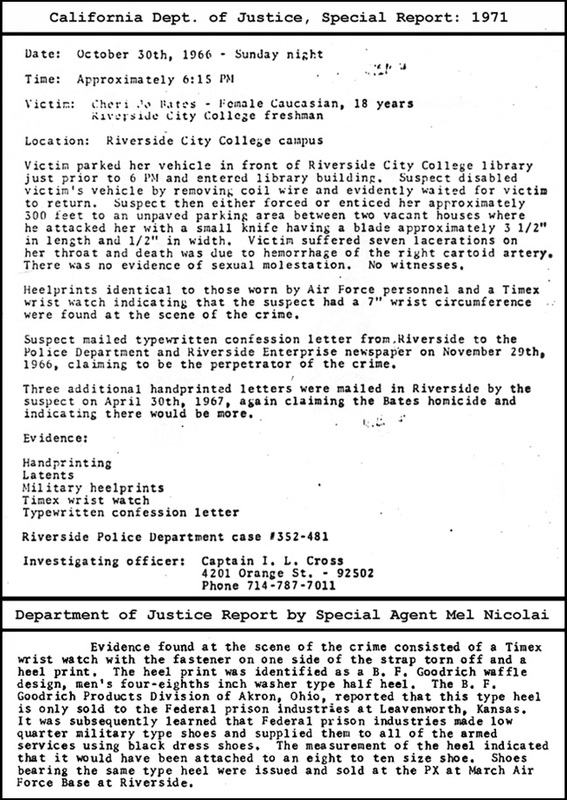 Grant wrote: “Am I engaging in pure speculation again, as I did in assuming that Cheri Bates was actually kidnapped and never went into the RCC library?” Police discovered several books in Bates’ car which had been checked out from the RCC library that night, and, according to several Riverside police investigators, Bates was seen in the library that night. Grant wrote on the Zodiac’s removing a portion of Paul Stine’s shirt: “Since we know the Zodiac took similar ‘souvenirs’ at his other crime scenes, we can at least assume he did it to be able to prove his guilt later on.” The police reports clearly state that the Zodiac never took anything from any of the other crime scenes. While the Zodiac did ask for Bryan Hartnell’s money and car keys, the killer left both behind at the scene. Grant wrote: “SFPD misidentified the slug from the gun, most likely because it sustained significant damage colliding with Paul Stine’s skull. It was NOT from a .9mm.” There is no credible evidence to support this bogus claim and Grant provides none. This is yet another instance in which Grant appears to do nothing more than parrot Penn’s bogus claims without providing any proof to back up his claim. Grant wrote: “The killer shot David Faraday point blank in the left temple, then put five shots within the space of a half-dollar in Betty Lou’s upper chest. This was incredible marksmanship, considering he was pursuing her on gravel and the area was pitch dark that time of night.” Here, Grant is simply parroting bad facts from Robert Graysmith’s book. Grant is apparently unable to accurately read an autopsy report, and although he repeatedly cites the Fincher film, Grant has apparently never watched the documentaries which accompany the DVD release and show the photograph depicting the wounds in Jensen’s back. 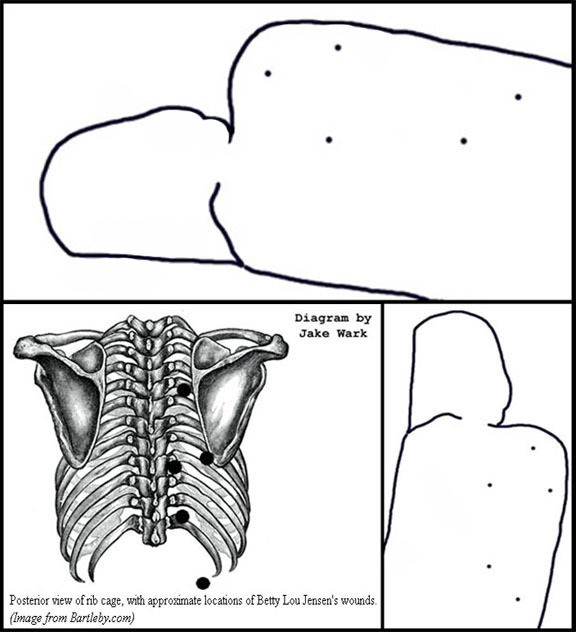 Years ago, Jake Wark used the autopsy report to create his own representation of these wounds, and his result was remarkably similar to the photograph of the bullet holes in Jensen’s body as seen in the illustration below, traced from a photograph of Betty Lou Jensen’s body taken at the morgue. Grant wrote: “Darlene, the driver, was mortally wounded, but Michael ultimately recovered and was able to describe his attacker to a police artist.” Michael Mageau never worked with a police artist, and, by his own admission, he did not get a good look at the killer and only saw the gunman in profile. Grant never provides any evidence to support this claim. Grant wrote: “Michael Mageau described Darlene’s car being ‘herded’ into the parking lot by a motorist who tailgated her until her own Corvair stalled against a fallen log.” This was not the story told by Mageau to police, but the story attributed to him by Darlene’s sister Pam, claiming that Mageau provided this account of the crime to Dean Ferrin’s cousin Sue Ayers. This version appeared in Graysmith’s book, and has been repeated by many people over the years, however, Sue Ayers refuted this entire story. Grant also makes the kinds of factual errors which not only prove that his research was sorely lacking, but that he never conducted a two minute Google search which would reveal the accurate information. In the chapter of his book titled J. 10 Days: October ’69, Grant wrote: “2, [Zodiac] calls The Vallejo Sheriff’s Office after the shootings at Blue Rock Springs… 4, [Zodiac] calls the Napa Sheriff’s office from the Napa Car Wash after the Lake Berryessa attacks.” After the shooting at Blue Rock Springs Park, the Zodiac placed a telephone call to the Vallejo Police Department. After the attack at Lake Berryessa, the Zodiac called the Napa Police Department. Grant wrote: “When police traced the call, they found it had been placed from a booth across the street from The Vallejo Sheriff’s Office.” Again, Grant is simply repeating bad facts from Graysmith’s book. 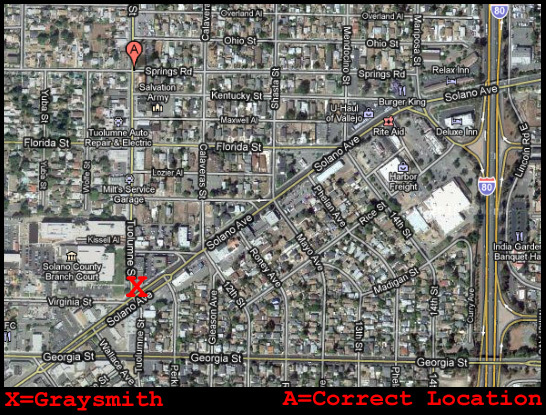 Graysmith was wrong about the location of the payphone used by the Zodiac. The correct location was several blocks from the sheriff’s office, at the intersection of Tuolumne Street and Springs Road– a fact Grant would have known if he had conducted even cursory research. Grant wrote of “all those Winchester Western slugs littering The Blue Rock Springs Golf Course parking lot.” After more than two decades of “research,” Grant is still mistaken about the correct location of this crime, which occurred across the street from the golf course in Blue Rock Springs Park. This is the kind of “research” Grant uses to accuse four people of murder. Personally, I find it amazing that a man could spend two decades “researching” this case and yet never take the time to locate the correct crime scenes on a map. However, in the thirty years which have passed since Gareth Penn first discovered his radian theory, he never bothered to notice that his theory was pure nonsense. One of the newest Zodiac scavengers, Steve Hodel (MOST EVIL), has also repeated this bogus theory as fact, claiming that the radian connects the Zodiac and Black Dahlia murders. Even after I posted a thorough and irrefutable debunking of the radian theory, Penn and Hodel never retracted their statements and never admitted that they were wrong. 1) Using an accurate map. 2) Accurately locating the correct crime scenes. 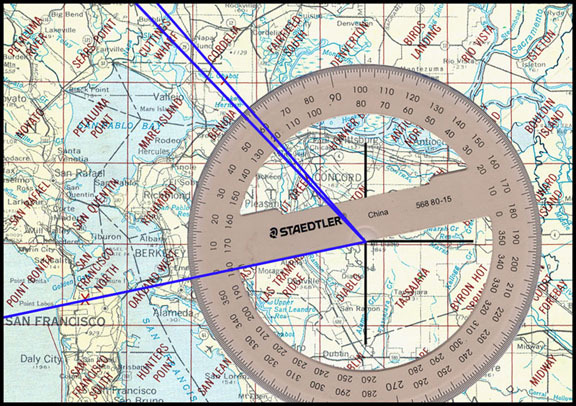 3) Accurately measuring the geometric angle created by these locations. Anyone who follows those three steps will discover an irrefutable fact: the radian theory is not valid. Gareth Penn, Steve Hodel and Ray Grant have never followed these simple steps, and never bothered to check their own facts before claiming that the radian served as the basis for their conclusions. Like Penn and Hodel, Ray Grant will most likely ignore this article and the debunking of the radian theory which he described as “the starting point for the cryptographic speculation about the case.” Responsible journalists and amateur sleuths have a moral obligation to verify their own claims before presenting their work to the public, yet none of these men did so. Twenty years is a long time to devote yourself to anything, let alone writing a book in which you claim to have solved an infamous crime. After reviewing Grant’s posted material, I am forced to an inescapable conclusion– Ray Grant has wasted two decades of his life on some of the most amateurish and absurd nonsense I have ever seen. Grant’s claims have no merit, he has presented no credible evidence to support his claims, and he has acted irresponsibly by posting his baseless claims in public. No responsible person would act as Grant has, and his behavior demonstrates an absolute disregard for the victims, their families, the investigators, the public, the truth, and YOU. The only thing more frightening than the notion that someone can make such accusations in public without a shred of proof is the fact that this man could spend two decades creating this garbage. Gareth Penn first used his bogus radian theory and a large collection of factual errors to accuse Michael O’Hare of murder. Decades later, Penn now stands accused by Grant, Christopher Farmer and others who use the same dubious methods to call him a murderer. Penn never bothered to check his own facts before accusing O’Hare, but, once he stood accused of the same crime, Penn suddenly developed an interest in “facts.” If fate has a sense of humor and irony, someone else may surface to accuse Ray Grant of murder using similar nonsense. Then, and only then, will Grant suddenly develop an interest in facts and responsible reporting. In the final equation, Ray Grant is just another one of the many clowns of private life who continue to do very real damage to the study and public perception of this case.